One study reports that a 25 percent modal shift from cars to motorcycles can eliminate congestion entirely. Photo by Jean-Etienne Minh-Duy Poirrier. 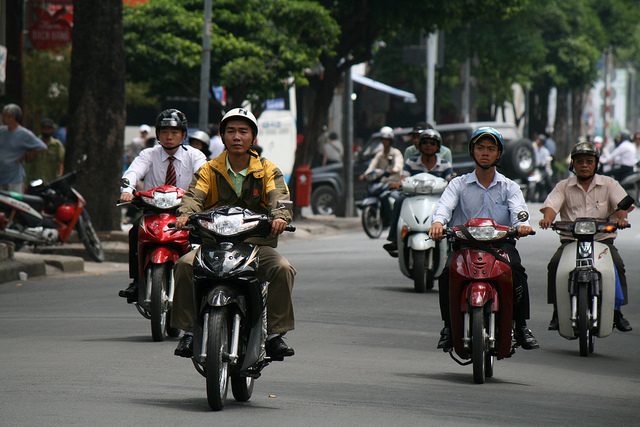 The Belgian consultancy, Transport & Mobility Leuven, conducted a detailed study on urban traffic congestion, and found that a slight shift in mode share from cars to motorcycles can significantly reduce congestion and greenhouse gas emissions. Though both vehicles rely on gasoline for fuel, the study reports that a 10 percent shift from cars to motorcycles would result in a 40 percent decrease in lost time and a 6 percent decrease in emissions. A 25 percent modal shift to motorcycles was found to eliminate congestion entirely, Gizmag reports. The United States Government Accountability Office conducted a study on the impact road pricing has on traffic congestion. Currently, the Department of Transportation estimates that traffic congestion costs about $200 billion every year. Road pricing mechanisms can motivate drivers to share rides, use transit, travel at less congested times, or pay to use tolled lanes, according to the DOT. Although road pricing may help ease congestion, the study also acknowledges the importance of incentives behind such pricing mechanisms. As pricing projects become more widespread, equity concerns may also grow, especially where pricing is not only used to manage congestion but also to raise revenue to build new projects. Chris Cherry, an assistant professor in civil and environmental engineering, along with Shuguang Ji, a graduate student, analyzed the emissions and environmental health impacts of five vehicle technologies in 34 Chinese cities. The team found that electric cars cause much more overall harmful particulate matter pollution than gasoline cars in the given cities. The team of researchers discovered that the power generated in China to operate electric vehicles emit fine particles at a higher rate than gasoline vehicles, but because emissions related to electric vehicles often come from power plants located away from population centers, people breathe in the emissions at a lower rate than they do emissions from conventional vehicles. The New York City Metropolitan Transportation Authority has been working on a Second Avenue Subway line for 5 years now. The agency recently released the results of an air quality study conducted by Parsons Brinckerhoff to address concerns from residents on air quality and public health issues. The study collected minute-by-minute data for various pollutants, such fine particulate matter, sulfur dioxide and silica, and concluded that most measured pollutants were below national air quality and industry standards. When there were spikes in some types of pollution in the area, however, they weren’t triggered by subway construction but rather by traffic and the dirty boilers of surrounding residential buildings, DNA Info reports. Researchers studying stroke patients in the Boston area over a 10-year period found that an exposure to ambient fine particulate matter, generally from vehicle traffic, was associated with a significantly higher risk of ischemic strokes, especially on days when the Environmental Protection Agency’s air quality index was yellow instead of green. The researchers looked at 1,700 stroke patients and found that the peak risk to patients from pollution exposure occurs 12-14 hours before a stroke. Although the levels of PM2.5 in Boston are lower than those in many other parts of the country, there is still a risk of stroke on days with higher pollutant levels, the study’s senior author explained.